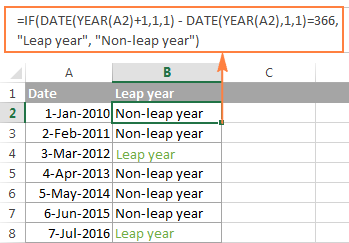 This tutorial explains the syntax and uses of the Excel YEAR function and provides formula examples to extract year from date, convert date to month and year, calculate age from the date of birth and determine leap years. In a few recent posts, we have explored different ways to calculate dates and times in Excel and learned a variety of useful functions such as WEEKDAY, DAY, MONTH and WEEKNUM. Today, we are going to focus on a bigger time unit and talk about calculating years in your Excel worksheets. The YEAR function returns a four-digit year corresponding to the specified date, as an integer from 1900 to 9999. Although you can enter a date as a serial numbers, this method is not recommended because date numbering may vary across different systems. Simple YEAR formulas can even understand dates entered as text, like =YEAR("28-Apr-2015"). However, Microsoft does not guarantee correct results when a date is supplied as a text value. When you work with date information in Excel, your worksheets usually display full dates, including month, day and year. However, for major milestones and important events such as product launches or asset acquisitions, you may want to view only the year without re-entering or modifying the original data. Below, you will find 3 quick ways to do this. To convert a given date to year and month, you can use the TEXT function to extract each unit individually, and then concatenate those functions within one formula. "mmm" - abbreviated months names, as Jan - Dec.
"mmmm" - full month names, as January - December. Where B2 is a cell containing a date. If it does not really matter how the dates are stored in your workbook, you can get Excel to show only the years without changing the original dates. In other words, you can have full dates stored in cells, but only the years displayed. yy - to display 2-digit years, as 00 - 99.
yyyy - to display 4-digit years, as 1900 - 9999. Please remember that this method does not change the original date, it only changes the way the date is displayed in your worksheet. If you refer to such cells in your formulas, Microsoft Excel will perform date calculations rather than year calculations. You can find more details about changing the date format in this tutorial: How to change date format in Excel. 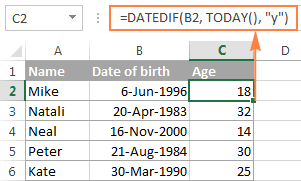 There are several ways to calculate age form date of birth in Excel - using DATEDIF, YEARFRAC or INT function in combination with TODAY(). The TODAY function supplies the date to calculate age at, ensuring that your formula will always return the correct age. The first part of the formula (TODAY()-B2) calculates the difference is days, and you divide it by 365 to get the number of years. In most cases, the result of this equation is a decimal number, and you have the INT function round it down to the nearest integer. As mentioned above, this age calculation formula is not always flawless, and here's why. Every 4th year is a leap year that contains 366 days, whereas the formula divides the number of days by 365. So, if someone was born on February 29 and today is February 28, this age formula will make a person one day older. Dividing by 365.25 instead of 365 is not impeccable either, for example, when calculating the age of a child who hasn't yet lived through a leap year. 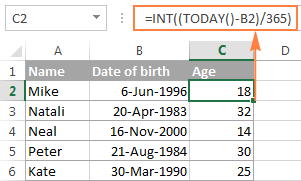 Given the above, you'd better save this way of calculating age for normal life, and use one of the following formulas to calculate age from date of birth in Excel. Y - to calculate the number of complete years. YM - to get the difference between the months, ignoring years. MD - to get the difference between the days, ignoring years and months. And then, concatenate the 3 DATEDIF functions in a single formula, separate the numbers returned by each function with commas, and define what each number means. For more formula examples such as calculating age at a particular date or in a certain year, please check out the following tutorial: How to calculate age in Excel - formula examples. As you know, nearly every 4th year has an extra day on February 29 and is called a leap year. 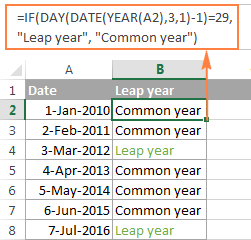 In Microsoft Excel sheets, you can determine whether a certain date belongs to a leap year or a common year in a variety of ways. I'm going to demonstrate just a couple of formulas, which in my opinion are easiest to understand. In this formula, the DATE(2015,3,1) function returns the 1st day of March in the year 2015, from which we subtract 1. The DAY function extracts the day number from this date, and we compare that number with 29. If the numbers match, the formula returns TRUE, FALSE otherwise. 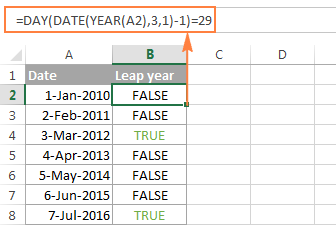 As already mentioned, these are not the only possible ways to calculate leap years in Excel. If you are curious to know other solutions, you can check the method suggested by Microsoft. (As usual, Microsoft guys are not looking for easy ways, are they?) And you can find 14 other formulas on this blog. Hopefully, this article has helped you figure out year calculations in Excel. I thank you for reading and look forward to seeing you next week. 94 Responses to "How to convert date to year in Excel & calculate age from date of birth"
I want to find out the age (years, months, days) on a particular date by using date of birth. I want to know my age on 25/08/2015 in years months and days by using MS Excel. =DATEDIF(A1, B1,"Y") & " Years, " & DATEDIF(A1, B1,"YM") & " Months, " & DATEDIF(A1, B1,"MD") & " Days"
This formula not work in my excel2013. So give me result with formula. When I did this formula I get NAME? Would appreciate if you give provide a formula for below scenario. Thank you in advance. Fifteen (15) to Thrity (30) days shall be considered as one month service while eight (8) to fourteen (14) days shall be condiered as half-month service. Hi Ablebits, can you help please? where T78 is a date of birth and I78 is a specified date (start of course). It shows me the age of a student in years and months. I'm trying to use conditional formatting to highlight where a student is under 18 years of age, but coming unstuck as it doesn't like the "y" and "m" text in the formula. "y" and "m" turn the output into a text string and that is why Excel cannot compare it with a number. That gives a True or False, where I definitely need to see the age in years and months. I'll try something else, thanks for the help though. - If you enter the formula in a cell, it returns true / false. To see the age in years and months, you can keep using your original formula. Hi ! This blog is very useful ! I use the DATEDIF function to calculate the age of children each month (in column the months for the next 10 years, and in raw the children). Now, I need to use a color for the cell where the child reaches "3 years 0 months 0 days", another color for the where he reaches 4, another color for the cell where he reaches 5... and so on. - how to highlight (or use a specific format) when I use the datedif function ? - how to highlight the cell where a child reaches 3 yo but not the other cells where is over 3 ? hi Need to set Remark on asset aging e.g. I would like to convert 24 years 6 month into 25 year by rounding it. What is the correct formula for this.I wl b glad if u replay me promptly. Thank you very much. To calculate years of service, is it ok to use 12/31/2016 as the date instead of today's date? I'm using the formula: YEARFRAC(A1,B1,1). A1 being the 12/31/16 and b1 is the hire date. How can I convert date of birth to age if not using 'Today'? I want to find the age as of January 1 of a particular year, and when I add that value in my equation I get a circular reference warning and an incorrect answer. someone can help me send the formula on my email. in certificate it is written age as 19 years 01 month and 11 days as on 01 march 1983. I need formula for giving Financial year to a specific date. (eg. if the date is 31-03-2016 formula should say "2015-16" like that if date is 31-03-2015 answer should be "2014-15"
Hope you will answer my query. Can you please help me our with the solution formula? how to remove point in between date of birth for eg-12.09.2011. and then click "Replace" or for multiple selection you can use "Replace All"
Hi I have a list of excel sheets where patients ages are changed to Months (for e.g. 24, 36 mths etc). How do I calculate the average age of the list? How do I find the median and range of ages? This is a list of 375 patients. Please advise. Thank you. Is there a way to do calculate the average of a column that has the following information formatting: 2 Year(s), 6 Month(s), 19 Day(s) ... or is there a way to calculate that information into date format using date-to-age function. I want to know my age with month and days by using date of birth, How to and which formula can I use? I need to calculate years of service from the start date to 12/31 of the current year, sort of like the today function, but it will be a set date of 12/31 and the year will change every year. Hi I need to know how to convert something like, 48 years and 2 months into years. Would really appreciate an answer, thanks. I have a worksheet with drop down list for day, month and year in separate cells. I want a formula to calculate and display the age in the next cell. I tried a lot, but it is not calculating from the drop down list. Please help me. CAN I USE THE FORMULA =YEARFRAC(N141,O141,1)*12 TO CONVERT MONTHS AND DAYS TO DECIMAL? I am trying to calculate age from year of birth only (not DOB). It seems to work using simple subtraction however when I click and drag the bottom right corner of the highlighted area it just copies and pastes the contents of the cell rather than using the subtraction formula for each cell in the age column. How do I correct this as I have a lot of data? Let's say I have 11 tables with different amount. 567 suppose if this are days, how do we calculate the avarage in years ? Suppose Date of Birth of a person is 07/12/1962. I want to calculate on what date he completes his 55 years of age. Please comment. Its urgent. I think Svetlana Cheusheva can solve it. If my understanding of the task is correct, you just need to add 55 years to the date of birth. 1day in cell a1, January in cell a2, and 1992 in cell a3 plz solve this. =DATEDIF(DATE(A3,MONTH(DATEVALUE(A2&"1")),A1),TODAY(),"y") & " Years, " & DATEDIF(DATE(A3,MONTH(DATEVALUE(A2&"1")),A1),TODAY(),"ym") & " Months, " & DATEDIF(DATE(A3,MONTH(DATEVALUE(A2&"1")),A1),TODAY(),"md") & " Days"
Hi. I'd like to display the difference between two reading test ages as a negative if a pupil's results have deteriorated and as a positive if they have made progress. For example, the positive difference between: 06 Year(s), 05 Month(s) and 06 Year(s), 11 Month(s) (after the next test). I have a spreadsheet that lists the employees start date. I am trying to separate into bands- 0-6M, 6M-1Y, 1Y-3Y,3Y-5Y,5Y+. Any ideas? I can add columns, then sort by, but this is a large organization, and I'm trying to automate as much as possible. Trying to calculate the age of a student at the time they participated in a program. I have the date of birth and I have the year of the program in which they participated. Some students participated in multiple programs in various year. Is there one formula I can use to calculate the estimated age at the time the student participated in the program? In my case the employee of company are working earlier than 2000, but a policy was introduced in 2009 by company in which employee who is working earlier than 2000 can get his 1st salary increment of 15% of basic pay after 2 years i.e. 2011 and the next increment of 10% of basic pay in the third year i.e. 2012. So I have a column with DOB DD/MM/YYY and I need a calculation to tell me YYYY they turned 65. Thanks for the amazing post; it helped a lot. No need to subtract one, or use EOMONTH, as the DATE function already treats the Year/Month/Day arguments as offsets, not absolute values. Hi Svetlana, I have a column that is using the format m/d/yyyy h:mm. How do I isolate the year? Where I should get 24 months. I have only a age for 300 employees, like 30 yes 20 yes and 40 yes then how do I calculate their birth year in excel.. It will be a great help if you could provide me a formula on this.. I have only a age for 300 employees, like 30 yers 20 yers and 40 yrs etc.. then how do I calculate their birth year in excel..
How do I take a cell with a date in it and convert it to years using a specific date not TODAY as a date. Example I need 06/01/1996 to show me how many years they have been working for us from hired date through 12.31.2016. Could you please help me to collect data from age. I used =DATEDIF(actualdata,NOW(),"y") and I got everyone age. I am trying quickly recognise who is under 16 and over 65 from my list and how many people is under 16 and how many people is over 65. I be thankful if you show me the way how to this. trying to figure out the date. if age 18 or more at time of exam, then purge date is 7 years from date of exam. If under 18 on date of exam, then purge date is 7 years from 18th birthday. and about 700 other students. how do I find the purge date? I want to calculate Date of Birth of 25 years 4 months 12 days to date/month/year(ex.01/01/2017) format, kindly help, thanks. I need a formula that will calculate the number of days in the year over a period of time, not from January to December, that will take into account leap years. For example a date of contract starts 01/02/2016 and ends 31/01/2017 = 366 days. But, a contract that starts 01/04/2016 and ends 31/03/2017 is 365 days. How do I create a formula that will take this into consideration across several years and lines of data? we have a great and easy tutorials on How to copy formula down a column and Copy formula to the entire column with step-by-step examples that may be of help to you. Formula for calculating when a person will be 17 years and 6 months old? aHow can I exit 35 months in Excel? How can I exit 35 months in Excel? Could you please help me to change the year format. 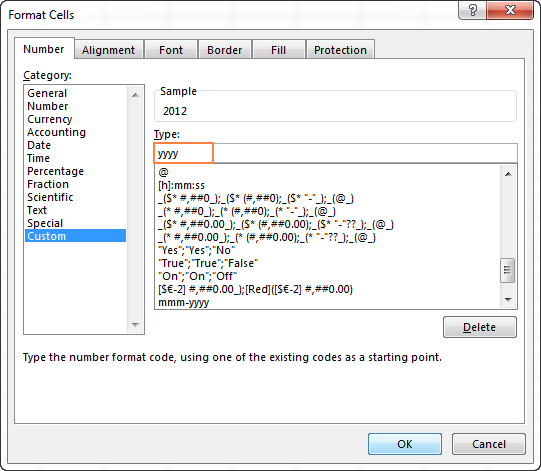 After you entered the date (make sure to enter the complete year - 2040, not just 40), select the cell and press Ctrl+1 to open the Format Cells window. There, go to Date tab and find the following data type: 14-Mar-2012. Select it and press OK. I am trying to figure out how many people were "rejected" in 2013, 2014, 2015, etc. without having to create numerous columns, etc. if you have an additional status column saying who was rejected, you can use COUNTIFS function. Please read this article to learn more about the COUNTIFS syntax and to be able to use it. I want to calculate service period in three different cell at excel. Ex- Suppose someone's service year is 05 Years, 10 Months & 09 days. I want to show above three result in three different cell. Is it possible? if possible please reply me. I am real big trouble. How can I add year fraction in excel. for e.g. I have 1st company experience as 2.6 (2 years 6 months) and next company experience is 16.10 (16 years 10 months) if I am adding both ideally my total experience is 19.4 (19 years 4 months) whereas if I am trying to calculate in excel, outcome is 18.76. Please advise if I could use any alternate formula to sum up year fraction in excel. =(2+16+TRUNC((6+10)/12)) &" years " & ((6+10)-(12*TRUNC((6+10)/12))) & " months"
I have one query regarding my data I have a cell-like 05;11;18 and where 05, 11 and 18 are the date so how can I extract and count it as 3. I want to know how to calculate retirement age remaining years in negative value means if employees already cross the retirement date so how they show in reaming year in negative value. Hello experts! I wish to calculate a student's current grade in school based on their graduation year. The trick is that students' grade levels change as of July 1st each year. Examples: A student's graduation year is 2021. Today is May 25, 2018. They are currently in 9th grade, but as of July 1st, 2018 will be in 10th grade. Perhaps it would be useful to assume that "graduation year X" really equals "June 30, year X"? Here are the graduation years and corresponding grade levels through June 30th. As of July 1st, the grade level will need to rise by 1. Further, could the formula cause the cell to be shaded yellow if the grade is 1-5, green if grade 6-8, blue if grade 9-12, and pink if grad? It would also be useful to be able to do the opposite - calculate a grad year based on their current grade in school. I know you must enjoy a good puzzle! If I have 13/05/2014 date and I want to convert to Financial year April to March how do I do? I have tenure as 17.5 years, need to know the joining date from today what formula I should use. How can i add year to date for payroll? I was wondering how i can add year to date to an excel sheet gor payroll i have no current year to date on the spreadsheet right now? I think you're asking how to create a running total. This is where the latest data is added to the existing total to display the most current total. This procedure is repeated each time data is added so that the sheet shows the newest data and the newest total. If this is what you want to do, you create a running total by entering a range formula which is part absolute reference and part relative reference. The range formula looks like this: $A$1:A1. Absolute reference with the "$", relative reference without it. Where A1 is the first cell in the range. After you've copied it down to row 6, 7 & 8. This will calculate the running total to row 8. Just continue to copy this formula down the "E" column to display the most current Year-to-Date. Hi, I hope you can help me with the correct formula to calculate separation pay. What is the formula to show that a fraction of at least six (6) months shall be considered as one (1) whole year. How can I get 24 years total years of service since 6 months should be considered an additional year? Thankful for your help in advance. I need to calculate the number of days that is in each month that regards to the Start date and End date. GENERATE ANOTHER COLUMN FOR YEAR USING IF FUNCTION ? I NEED THE FORMULAR PLS? mere pass age ka column hai....date of year define karna hai kaise hoga..